bl.uk > Online Gallery Home	> Online exhibitions	> Asia, Pacific and Africa Collections	> A Thakoor Dwaree. 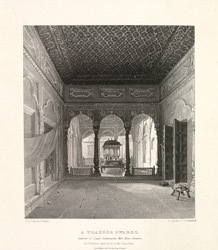 Plate 8 from the second part of James Prinsep's 'Benares Illustrated'. Prinsep (1799-1840), an antiquary and colonial administrator was assay master at the Benares Mint between 1820-30. The lithographs published in this collection were based on his original sketches of the various views of the 'holy' city of the Hindus. Of this plate he writes: 'Every family of respectability maintains an establishment for the service of their family religious rites:- a gooroo or pundit to give the muntras, or benedictions and absolutions, who also serves as a tutor for the children:- a purohit or priest to perform the ceremonies of marriage;...and a poojaree, or under-priest, to go through the ordinary routine of pooja to the Thakoors [gods] in the sanctuary or Thakoor-dwaree: Each member of the family is expected also to repair, morning and evening to the sanctuary to offer up his own petitions...The present sketch is in the same rich style of architecture, but the present proprietors are too poor to keep it in repair...The roof of the chamber is of a dark wood richly embossed...'.